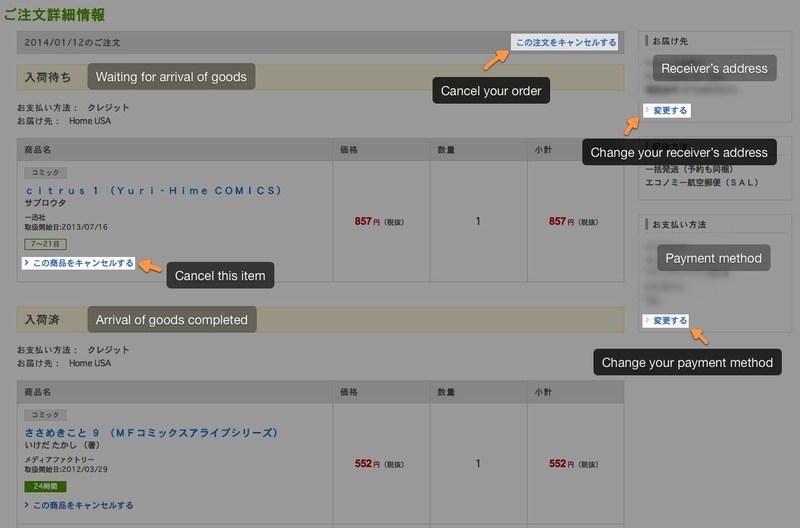 Thought maybe I’d write another guide to show honto.jp users how to change the details of your honto.jp order such as your address, or payment method, and/or cancel items within your order or cancel the order entirely. This only works if the items have not been shipped yet and this cannot be done for items that are being prepared for shipment already. Basically speaking, if you get to the order details and don’t see the links to cancel your order/items, then you can’t change/cancel it anymore. 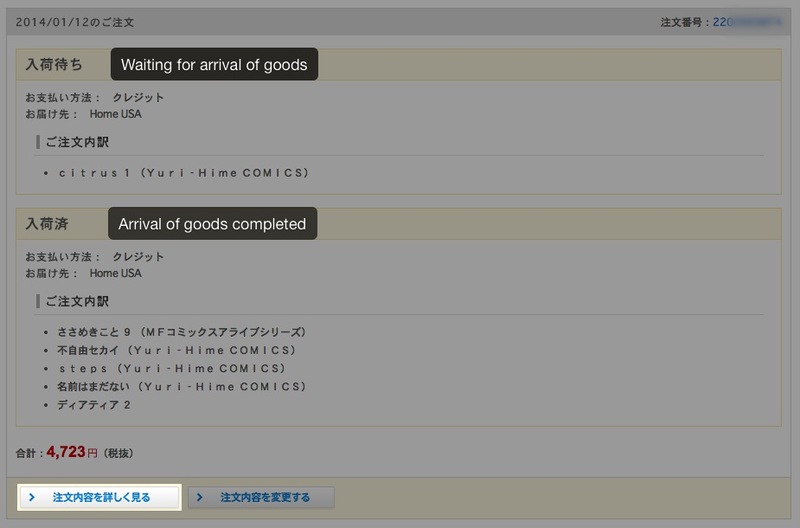 1) To get to your order history, on the top right corner of any honto.jp page, click on the blue word bubble with the word “My” in it and next to it, the Japanese “マイページ”, to get to your shelf of books along with the full sidebar on the left. 3) You should be brought to a summary version of your order history that should look something like this w/ the two buttons. If you get to this point and you don’t see two buttons below the order you want to change, then your order can no longer be changed. 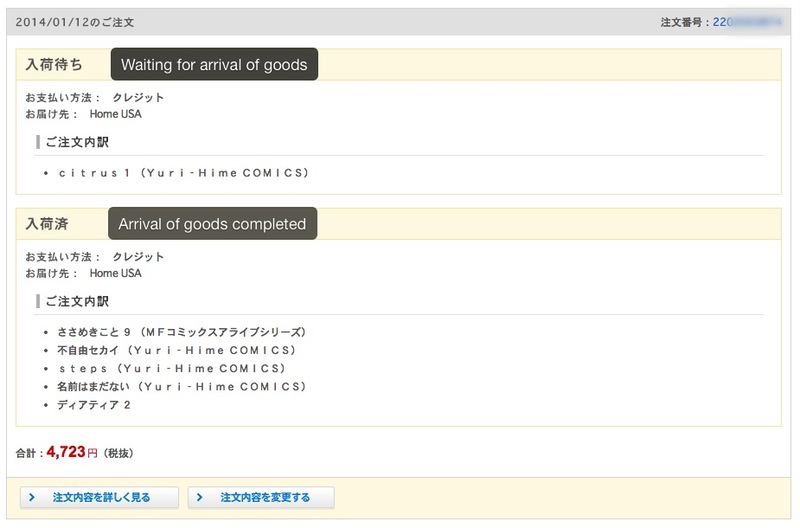 For canceling items, basically anything that says 「この商品をキャンセルする」 should be able to be cancelled. Hope this guide helps. If you need any help, as usual, leave a comment and I’ll get back to you with the best of my ability. Is it possible to change shipment method if the item hasn’t been shipped? I don’t think it’s possible; same with adding items to an order that’s already been placed. However, you can cancel your order and re-place the order with a different shipping method. 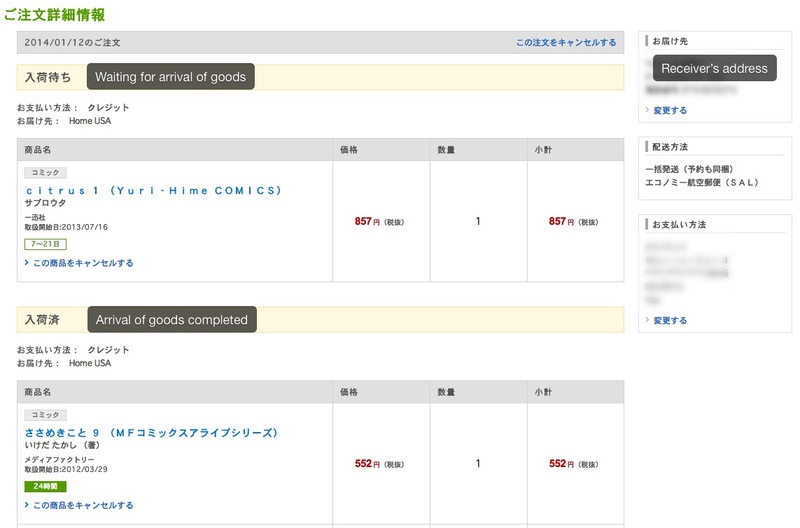 i ended up cancelling the order and re-ordered it with the right shipping method. Np. Wanted you to let you know before you can’t cancel anymore :).